A peaceful but pretty piece of Peshastin Creek. 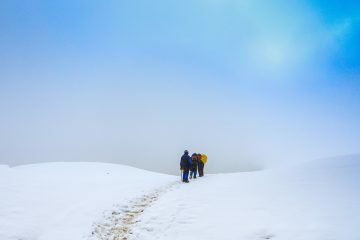 Sometimes when fear, self doubt, or laziness undermines your desire to tackle a trip on your bucket list, the simple ability to say, “I’ve done that one,” can be an effective motivator. There’s power in knowing that a goal will no longer irritate you with its perennial presence on your list … and there’s power in accruing bragging rights. The class-3 approach to Fresh Squeezed. Peshastin Creek, for example, has been on my wanna-do list for several years, but with its short boating season there are only a few weeks each year when the water is right for boaters of moderate ability like me. That time is now. Unfortunately as Paul Milem and I scout Fresh Squeezed, a class-4 rapid near the top of the creek’s 7.5-mile run, the friction points of fear and self-doubt erode our enthusiasm. Fresh Squeezed, a class-4 rapid with several tipping points…and no collection pools. 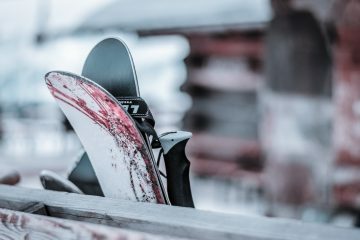 The rapid has several tipping points and, without an immediate roll, you could find yourself pinned against dangerous boulders wrong-side up or spilling over drops with your noggin leading the way. That leaves us facing a conundrum common to pushing physical or psychological limits in adrenaline sports: To live fully you need to commit, but to live fully you also need to live. Paul is trying to compare this rapid to others we’ve done but, with its sluices spilling over drops, precise position requirements, and its absence of a collection pool at the end, it is in a different league than anything we’ve attempted together. 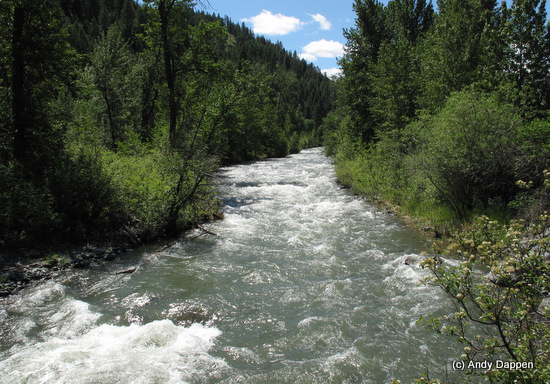 All of this weakens resolve–Paul wonders whether we should head down valley and kayak the Wenatchee River. I use my shallow motivation to offset Paul’s sensible doubts. I agree that Fresh Squeezed is best left for better boaters, but suggest putting in below the rapid and ticking off the final 6-plus miles of the creek. Paul bites. Halfway through we’re getting comfortable in fast, shallow water. We haul our kayaks a few hundred yards down from the highway’s shoulder, find a brushy launch, and commit. Immediately we’re swept into class 2 and class 3 rapids that come at us as if fired from a semi-automatic weapon. It’s only after we launch that I question my judgment. I’ve been in my boat once this season—a month ago—when the water was too cold to see if my roll was in tact. In this narrow creek where we are constantly dodging obstacles, I’m misreading the water: I’m a bumper car colliding with rocks and washing into holes. Three minutes into the maelstrom I’m asking myself, “What the heck were you thinking? !” I can’t wait until I’ve survived this gauntlet and don’t have to do it again. Even in it’s easier stretches, squirrelly water abounds. States of mind, however, can be tainted fast. My taint comes with the squirrely water of a moderate-sized hole–it catches me slightly off balance and, like a cyclist who takes a corner without a compensating lean, I tip. Not being a seasoned shallow-water, creek boater this is, I suspect, where I commit a grave mistake. I move to set-up my roll on the opposite side of the boat than the side that flipped over. This has me extending my torso as I drag my body under the boat. Thwack. My head tries to occupy a place in the time-space continuum that’s already occupied…by a boulder. 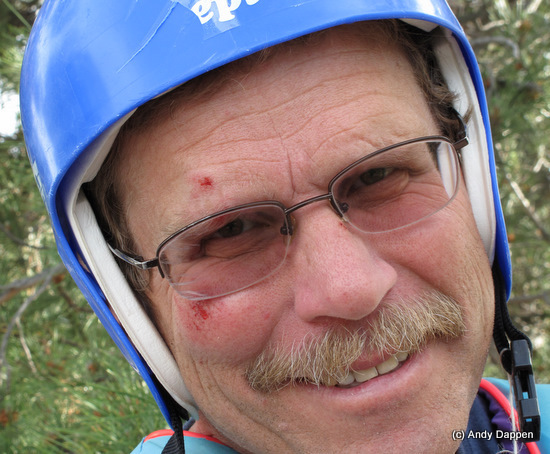 Luckily the boulder doesn’t dent my helmet, it smacks something that can regenerate itself …my face. I’m partly stunned, partly wondering whether I should keep my head under water to complete the roll, and completely panicked that another such blow will knock me out. I give up on rolling, eject from the kayak, and find myself standing in thigh-deep water. Blood and confidence drain from my head as I drag the boat to shore and drain it of water. Paul waits downstream in an eddy and, when we finally rendezvous, he examines my pretty face. He asks whether we should call it quits–we can easily drag the boats through the brush to the highway. My confidence is low, my face is in no mood for another thwack, but in my many years of paddling this is the first face-shot I’ve taken. I’m unwilling to let an anomaly undermine my desire to have done this stretch of river. We carry on and each big wave and squirrelly hole produces a “Holy Mother” spike of adrenaline. By the time we squirt out of the creek and into the Wenatchee River, the adrenal glands have been squeezed dry. We exit the Wenatchee River above the Dryden diversion dam and move from our solitary creek experience into a monster group of rafters hauling their boats around the diversion dam. “Whoa. What happened to you?” I’m asked in quick succession as various rafters examine my bruised, swollen cheek. “Fended off some boulders with my face in Peshastin Creek,” I tell them. Maybe they’re giving me looks of horror or disgust, but I interpret those expressions as ones of admiration reserved for tough guys. The women present seem particularly enamored with my bloody good looks. Ahhh, the beauty of a good story–already I’m happy to have done this creek. Difficulty. Class 4 if you include Fresh Squeezed. Fairly continuous Class 3 above Fresh Squeezed, and fairly continuous class 2 and class 3 water below. Average grade: 150 feet per mile. Maximum grade: 200 feet per mile. Season. Late spring and early summer, depending on the timing and amount of snow melt. Generally speaking, expect the creek to come in shape for a several weeks between mid-May and mid-June. Recommended flow: Best done when the flow is between 500 and 750 cfs at the Green Bridge Rd gauge, located about a mile above the mouth of the creek. In rough figures, Peshastin Creek tends to run between 6 to 10 percent of what Wenatchee River is running at the Peshastin gauge. 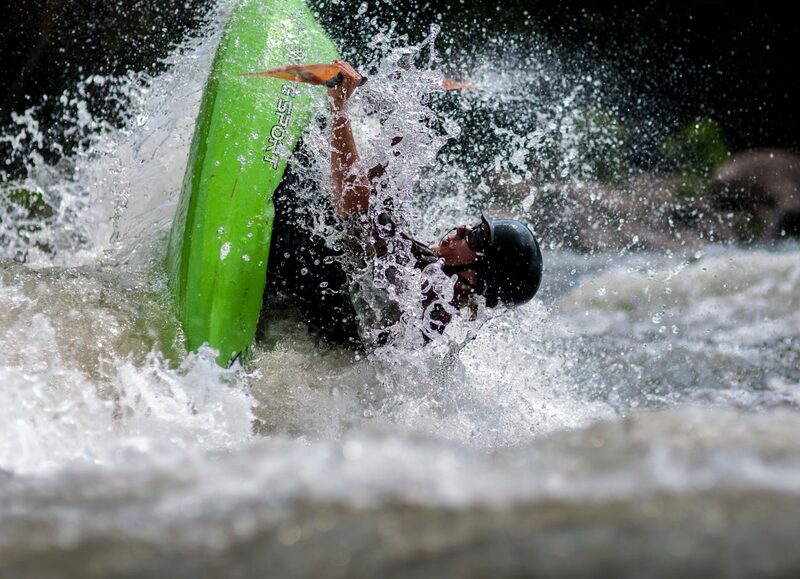 Expert kayakers run the creek when it is higher but the speed and fury of the rapids notch up. Recommended crafts: kayaks and inflatable kayaks. Access and Put-in. If accessing from the Wenatchee Valley, zero out the odometer at the Big Y junction (intersection of Hwy 2 and 97). 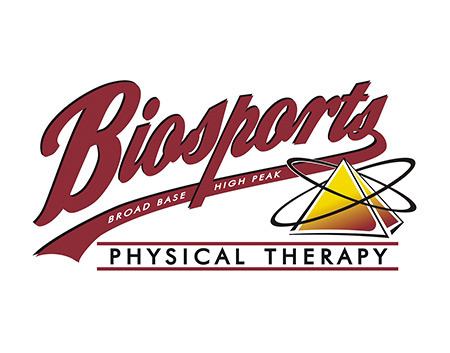 Drive south on Highway 97 toward Blewett Pass 6.2 miles (roughly Milepost 179) and scout Fresh Squeezed—it will be difficult to scout once you launch. Pull off on the right (west) side of the highway (shoulder is good) where there’s a grassy knoll between the highway and the river. Put-in below Fresh Squeezed if you don’t want to run it. To put-in higher, drive 7.5 miles from Y junction (Milepost 177.6) and park in a huge, paved pullout on the right (west) side of the highway or drive 8 miles from Y junction (Milepost 177.1) and park in a large gravel pullout on the right (west) side of the highway. Take-out. 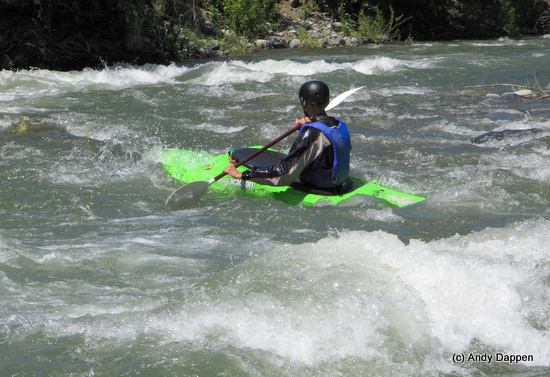 The two best options are 1) the Dryden Gravel Pit if you only want to do Peshastin Creek or 2) Riverside Park in Cashmere if you want to combine this creek run with some big-water kayaking on the Wenatchee River. To reach the Dryden Gravel Pit, drive Highway 2 until you’re 0.4 miles southeast of the Big Y junction. At Milepost 105.1, turn northeast onto Saunders Road. Immediately veer left and drive 0.3 miles. Just before the bridge over Peshastin Creek, turn right on a DOT gravel road with a small sign reading Dryden Gravel Pit. Follow this road 0.4 miles until its end at the gravel pit by the Dryden diversion dam. As of 2010, parking permits were not required. To reach Riverside Park, (on river right at the town of Cashmere), follow Highway 2 to Milepost 111.1. Turn onto Aplets Way and cross the bridge leading into Cashmere. At the second or third left after crossing the bridge, turn left and head east for two to three blocks. The street takes a jog but leads to Riverside Park. Turn left into the park. The boat ramp is near the upstream portion of the park. Trip Instructions. Put in and go. The river is constant action and you need to be comfortable scouting on the fly. It isn’t easy to scout Fresh Squeezed once you’re on the river, so do this on the drive (note: as of 2010 there was a sweeper blocking part of the channel on the class 3 bend leading into Fresh Squeezed). If you combine Peshastin Creek with a float of the Wenatchee River (an excellent option), pull over immediately on river right after exiting Peshastin Creek and portage around the Dryden Diversion Dam which has a bad, recirculating current and is a known drowning hazard. 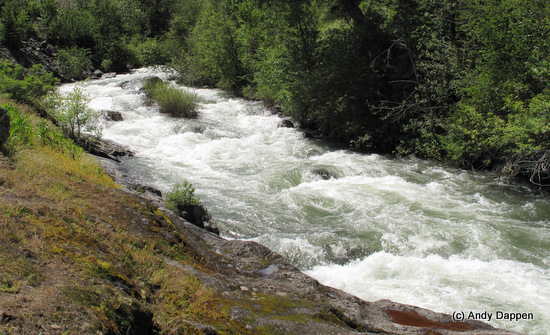 See our Whitewater Guidebook if you want more details about running the Wenatchee River. Hazards. Rocks, holes and woody matter (leaners, sweepers, strainers, log jams). This is a narrow river and a dead tree knocked down by wind or a new log floating downriver (especially during high water) can block the river at most any time. 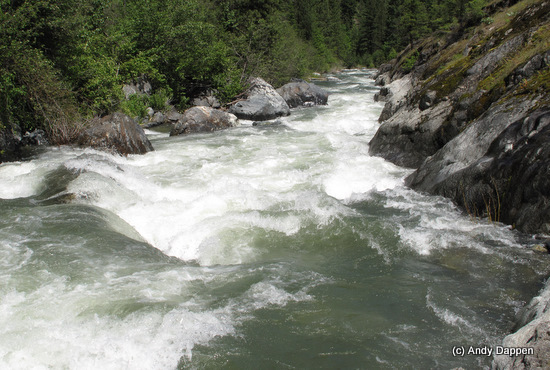 Check with Leavenworth Mountain Sports and our river reports to see what is known. Even if you hear the river is clean, assume conditions could have changed and keep looking well downstream to make sure the channel is clear. Reporter. Andy Dappen (June 6, 2010). Additional Information. Also see American Whitewaters’ guidebook information. More Whitewater: Maps and details of over 35 regional whitewater trips in this guidebook.